Latest beta is crashing whenever i open a webpage in Chrome (Beta). Let me know if you need any more info and I can try and get it. When you say it is crashing, do you mean the main app or the Chrome extension? Just a note on extensions : beta versions of browsers aren't supported (only stable). Edit: button now shows but crashes when I try and login. Anyway, by looking at you screenshot, i can totally recognize Android Lollipop, am i right ? If you pay attention to the 1Password Android forum, there seems to be several problems with Android L. You use a Nexus 5 maybe? Right now, only Nexus family received the 5.0 update, so it's early and i'm not suprised that you've encountered bugs considering how many things they have changed under the hood with Lollipop. Happening for me too. I'm using Chrome stable on a Nexus 5 running Lollipop. It actually happened when I opened the link confirming my email adress after registering my account here. The latest beta features are for Android L though , so I would have thought it would work, or at least be worth reporting bugs. Same issue. The latest beta is crashing constantly in and out of chrome for me. I was wondering : did anyone test with another browser ? It happened when in an app that used Webkit too. Add me to the list. 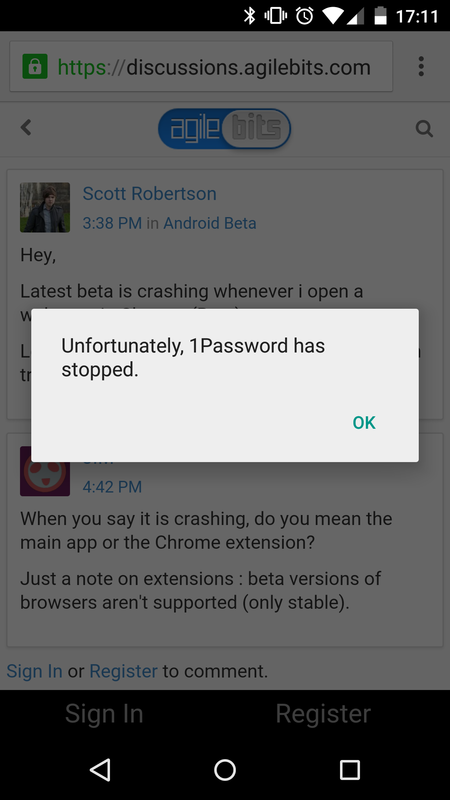 Attempted to use in-app filling in Chrome on Lollipop and 1Password crashed. Thank you all for reporting in to share about the crashes you are experiencing. While it isn't surprising to encounter bugs and crashes this early in the beta for in-app filling, it is still something that we want to address quickly. On November 17, we released an updated version of the beta that fixed a number of crashes that were occurring in 4.2b1. Could you check to make sure that you are now running 4.2b2 and let me know if you see an improvement on the new version? We recently released 4.2b3 (on November 22), which resolves an issue where in-app filling would crash when 1Password wasn't already running in the background. Please give that version a try and let me know if you are still experiencing the same crashes after updating. As far as tracking Lollipop issues goes, if the issues are unrelated to each other, please continue to mention them in separate threads (it's easier to track that way). However, if it's something like "auto-fill is not working in app A", then I agree that it makes sense to keep those in the same thread. As always, thank you for all of your feedback!